Meet Bernice at Homeward Pet today! Photo courtesy of Homeward Pet. Do you love chatty cats? Are you looking for someone to talk current affairs with, or converse with about the weather? Bernice may be your perfect match! She is a fun eight year old black and white kitty with a whole lot of purrsonality. Bernice will greet you with a gravelly meow, and keep right on talking, all the while purring and kneading away! She absolutely loves cuddle time and doesn’t hesitate to show it! 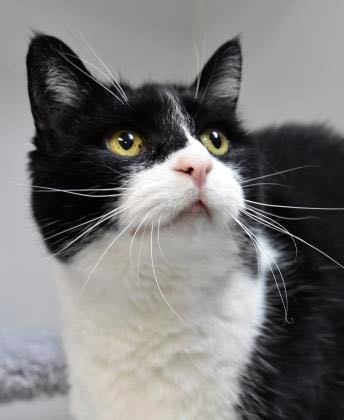 We don’t know if Bernice as met other cats, or dogs, so slow introductions are recommended. Because she loves affection so much, and can sometimes show that with little love nibbles, she’s looking for a home with older, cat savvy kids. Come meet this sweet, sweet gal today!